Today your child's progress report grades will be posted online on the HAC. Please note that the progress report is a working document that will change each over the next three weeks to reflect your child's new knowledge and skills. This progress report is an excellent tool to help you and your child target specific areas of challenge and to celebrate in areas approaching proficiency. It's Our Last Week Of Principal Appreciation Month! Celebrate our SUPER Mr. Conklin and Mrs. Smith every Friday in October. October 30th: Pick your biggest flower OR bring a SUPERsize candy to our Super Leaders! Homework and your child's leveled book is due every Friday. Please see that your child is self-assessing using the writing rubric before they turn in the writing assignment. Please have your child read his/her story to you and guide them on the rubric to see what elements they are including. Please see that your child is recording at least one book on his/her reading log each day. 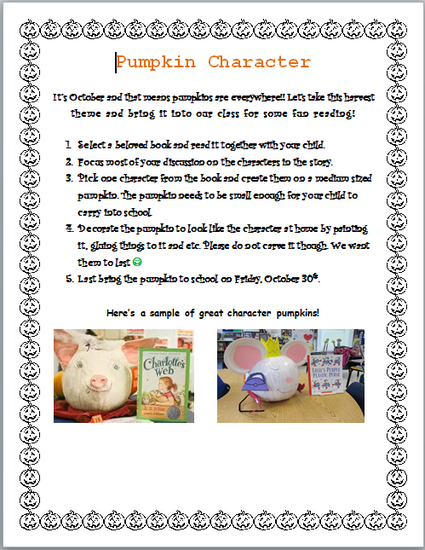 Please note that your child's book and pumpkin should be ready for display by Friday October 30th! See the Pumpkin Character below! Character of the Month: Responsibility. 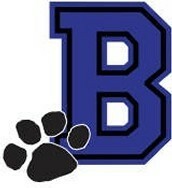 "Do what you are supposed to do • Plan ahead • Persevere: keep on trying! • Always do your best • Use self-control • Be self-disciplined • Think before you act — consider the consequences • Be accountable for your words, actions, and attitudes • Set a good example for others." A Learning Target is the desired goal of each task in which your child will actively be involved each day. In addition, it engages your child in reflective evaluation of their own performance. In Reading students are identifying similarities and differences between two texts. Is this story not-fake(non-fiction) or fake (fiction)? How do you know? Where is the story happening the most? What predictions did you make about the story? What good reader strategy do you use well? Why do good readers check the picture and words within big words? What words do you know that start or end with the difficult word? I like the part when (text evidence). It reminded me of (my connection.) OR I like the part when (text evidence). It reminded me of the story _______________ (second text) when (text evidence). 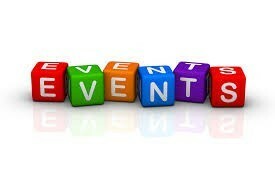 This upcoming week in writing we are continuing with small moment stories and the writing process. Be sure to go over the writing rubric with your child. Have him/her complete one part each day. So day one asks your child to write the when/where/what/who? Have your child tell you 3 of those elements and have them write it. We will continue representing tens and ones with two-digit numbers ending with and without zero. Have your child sort items into tens. Call each group of ten, "a group." If your child groups 3 groups of green Legos and has 4 left over, help them to see that that number is 34. We apply different forces to objects in order to understand how an outside force works on an object. We will continue to learn about what force acts upon and object to make it zigzag, go up and down, back and forth, round and round, fast and slow. Everything we contact ends up being moved or put back. The everyday activities, kicking the soccer ball, putting up a backpack or shoes, setting the table, brushing your teeth are relevant opportunities for your child. Monday: Wear your favorite Super Hero Shirt. "Courage"
Tuesday: Picture Day: Take a "I luv" my drug-free selfie. "Trustworthiness"
Wednesday: 50's to 80's dress up day! "Caring & Citizenship"
Thursday: Wear animal print or camo. "Respect." Friday: Book Character dress-up. "Responsibility"
At Beck we embrace the many opportunities for volunteering. 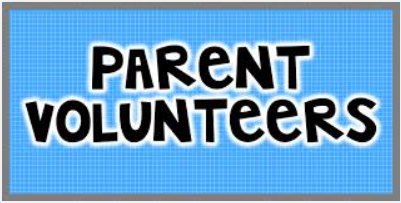 All parents who wish to volunteer in the classroom must have a background check completed prior to volunteering. If you are interested please visit the NISD homepage to fill out the background check. 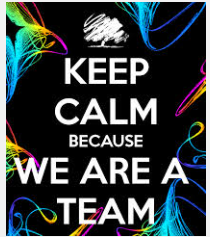 We would love to have you in the classroom, but have to ensure the safety of all students. We look forward to working with you this year! To ensure your child's transportation changes are met each day, please contact the front office or email Beckelem@nisdtx.org and CC your child's teacher with the changes. It would be best to notify us as early in the day as possible. Are you following Beck on Twitter? If not, please consider joining and keeping up with the amazing things happening on campus. You can also like us on Facebook! Click the links above to find out more.